In response to the article on the photo showing odd shapes on the bottom of the airliner that struck the South Tower, an Avionics expert has a RC lesson for Popular Mechanics and all of us. I took the first digital avionic system aircraft to the field in 1969 and have worked on numerous military aircraft, and studied the architecture on just about all commercial air-carriers over the last 30 some years. Instrumentation packages added to aircraft to augment control or take over automatic flight control are old hat. The package shown on your photo is evidently a receiver and the associated electronics required to replace the AFCS package (Auto Pilot and Stability Control Unit). The two blade antenna (CIRCLED IN YELLOW) are not normal (Their reflections makes it looks like a last minute add on.) for this type plane. They are VHF (too large for UHF) antennas used to control the replacement autopilot package. This looks like a remote control package on this aircraft. What you are looking at is not the normal configuration of a commercial aircraft. In UAV applications, signal bounce off the earth or buildings may induce fading, causing signal breakup. DTC is reknowned for its line of true diversity receivers, using spatial diversity to overcome fades and multipath. 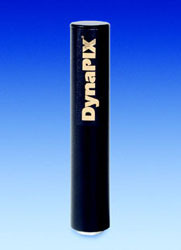 Pairs of receivers and antennas tuned to the same frequency are used to receive a single transmitted signal. A proprietary voting logic board votes to the best signal during the horizontal retrace, over 15,000 times per second. This greatly enhances video quality. THE PREDATOR is state-of-the-art UAV technology. Blade antennas as on the South Tower airliner are circled in yellow. 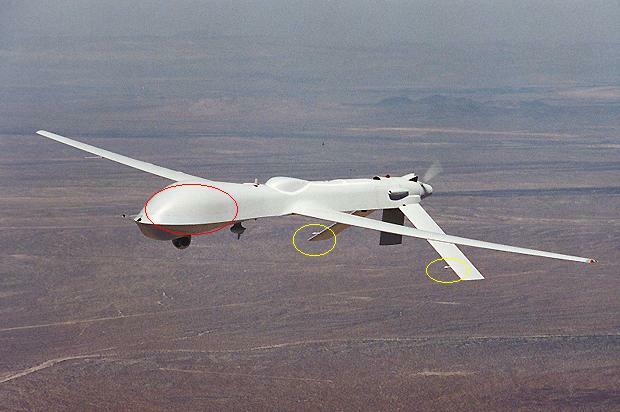 More antennas are located inside the front of the aircraft circled in red.